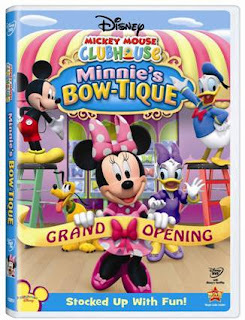 Mickey Mouse Clubhouse: Minnie's Bow-tique, released today February 9th, is a new dvd that features four Minnie-themed stories including a never-before-seen episode and a fun Minnie magnet bow frame. Each episode is so cute and is a learning experience for your child. They will enjoy interacting with Minnie, Mickey and friends and helping decide what Mystery Mouseketool to use in each adventure. There is just something about Mickey Mouse that NEVER gets old. And as old (ok, I know 30 isn't really old ~ but some days it sure feels it!) as I'm getting I still enjoy them. :) I love being able to share him and his friends with my kids. Here are some sneak peek video clips just for you!